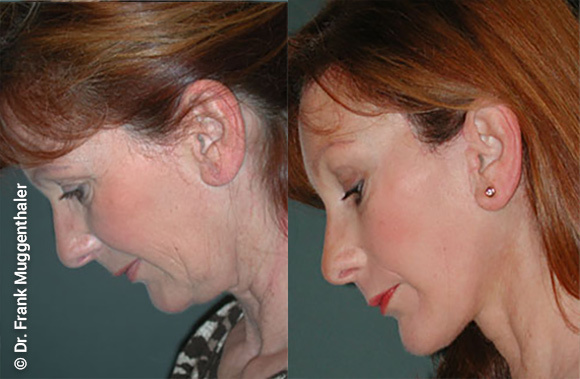 A facelift achieves a young and fresh radiance by restoring clear, dynamic facial features. 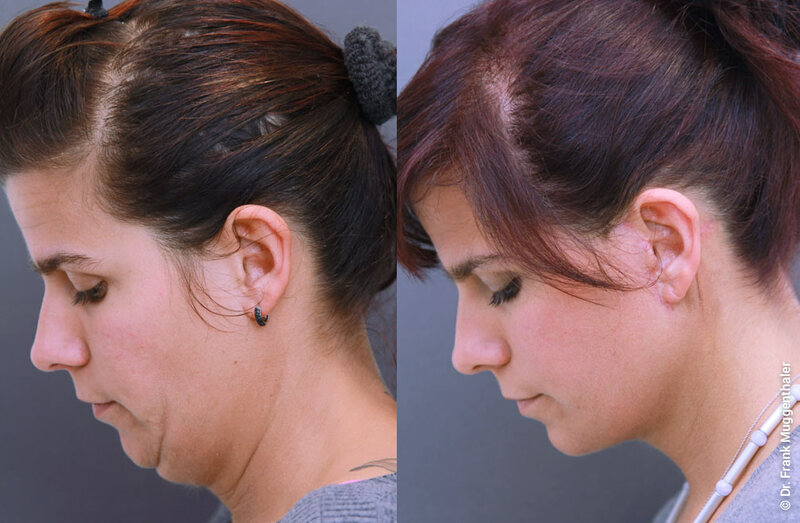 We have improved traditional SMAS Facelift-Techiques in many details to make the procedure more effective and less discomfortable. 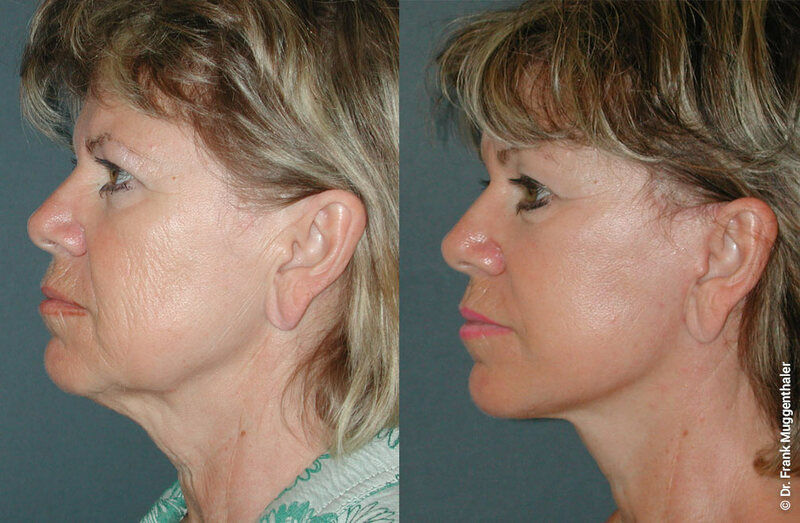 Dr. Frank Muggenthaler had a very extensive training by the best and most famous facelift surgeons in the world. As an experienced facial surgeon, he recognises which aspects disturb the harmony of a face and develops an individual treatment plan for you. 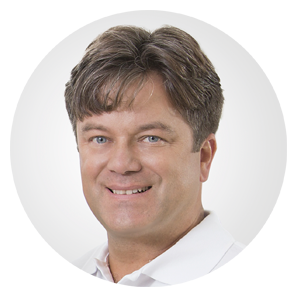 In a detailed consultation, Dr. Muggenthaler will discuss with you whether additional or alternative measures make sense. 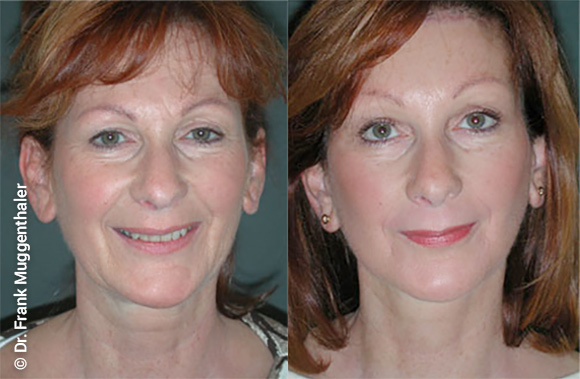 For example, an eyelid lift, a lifting of the eyebrows or a treatment of skin wrinkles. Before and after a lifting of the forehead, cheeks and neck. The comprehensive and even correction allows a particularly harmonious result. Before and after a lifting of the brows, cheeks and neck. 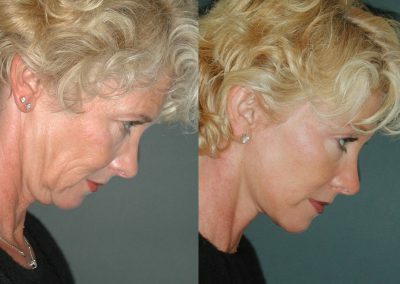 After the lifting of the cheeks and the neck, clear contours become clear again, giving the entire face a younger appearance. Six weeks after a face lift and a deep peeling of the mouth region and the lower eyelids. 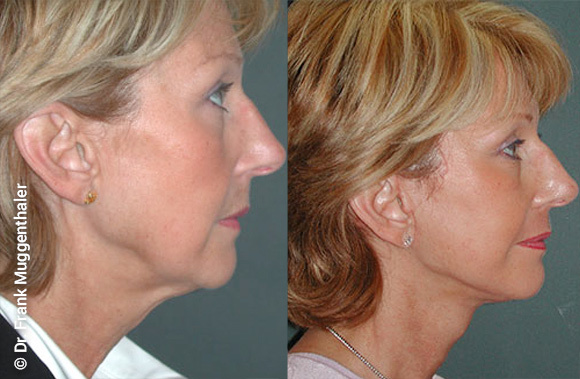 Face and neck lifting straightens the lower jaw line and gives the neck a clear contour. 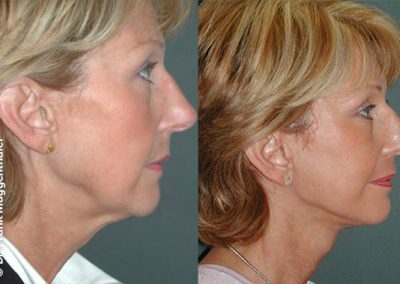 In this 26 year old lady, a neck lift was used to create a distinctive contour of the neck. 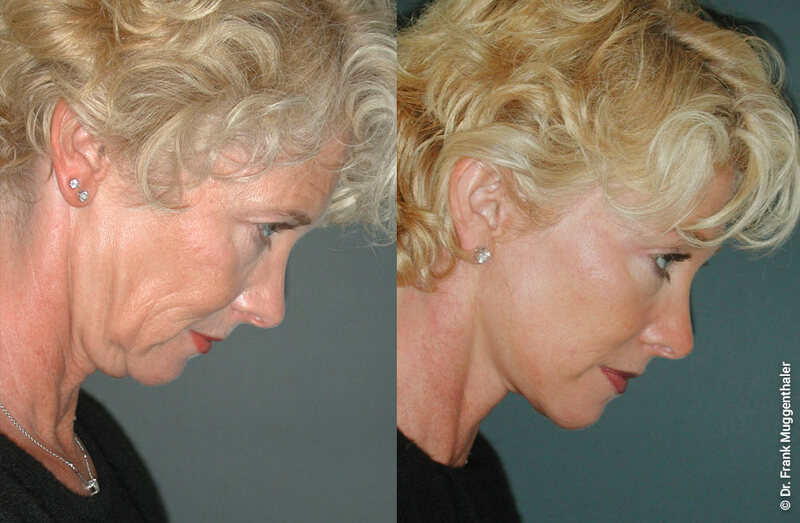 Facelifts are one of the most frequent procedures performed by Dr. Muggenthaler. Thanks to his many years of experience and the application of state-of-the-art techniques, a natural rejuvenation of the face is achieved. Before the facelift you inform us about your wishes, expectations and concerns in a detailed conversation. Your state of health and regularly taken medication, which can lead to an increased risk, are particularly important to us. Together with you, Dr. Muggenhtaler analyses your face in front of the mirror. Maybe you already know exactly which detail you want to change. You may also wish to improve your appearance without knowing exactly where to start. Don’t worry: together we will find your personal way to an attractive charisma. The top priority when selecting treatment methods is to avoid complications and inconveniences. We take a lot of time for that. The trust in our treatment and your healing success are based on the fact that there are no ambiguities between doctor and patient. After the consultation we can confirm the arising costs bindingly to you. The decisive factor for the success of the treatment and the operation is the phase of recovery and follow-up treatment – sufficient time should be allowed for this. Depending on your state of health, we will determine which preliminary examinations (e.g. blood test or ECG) are necessary. During the consultation we will tell you which medications you may take regularly. Avoid alcohol and nicotine consumption on the day and in any case in the evening before the operation. In order to guarantee an optimal quality of the intervention, we never perform an operation under time pressure. 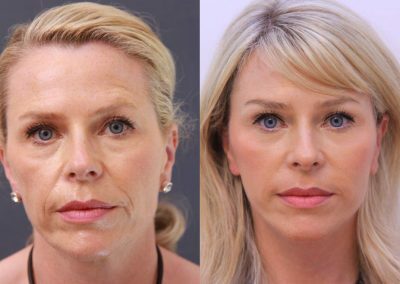 Thanks to a generous time schedule and methods proven over many years, our patients have significantly fewer problems with swelling and discolouration than patients who have undergone other facelifting methods. With facelifts we combine minimally invasive techniques with particularly effective surgical procedures: According to a method developed by us, threads are fixed in the deep layers of the face in order to create youthful contours safely and permanently. Thanks to this gentle technique, all lifts can be performed under local anaesthesia under twilight sleep. This means that stressful anaesthesia can be dispensed. After that, the patients spend one or two nights in the clinic. 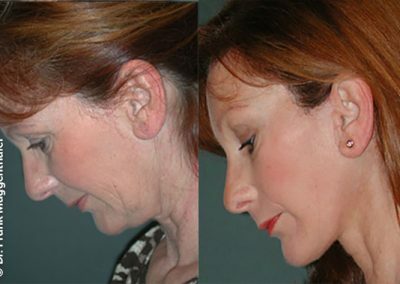 In order to achieve particularly long-lasting results, we combine minimally invasive methods with multi-layered, in-depth techniques in a facelift. Thanks to this innovation, regeneration takes place much faster. 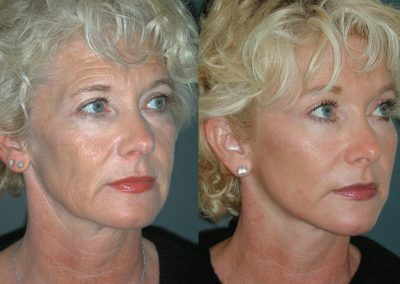 Which results are realistic for a facelift? Which ones aren't? Realistic is what you can achieve by standing in front of the mirror and lifting your brows and cheeks and tightening your neck. Depending on the method, wrinkles can be reduced by 50-80 percent, and a total rejuvenation effect of 8-10 years can be expected. Is the cut visible afterwards? How's the scar healing? We use a scar care programme that has been tried and tested over many years and is based on a number of perfectly coordinated ointments. In the first week after the facelift, smaller crusts may be present in some areas, after which slight redness may be visible for about six weeks. With proper care by the patient, the scars are virtually invisible after three to six months. Is a facelift an option for me? If you wish to rejuvenate and improve your appearance, a consultation with MUGGENTHALER ÄSTHETIK is the first step on the way there. 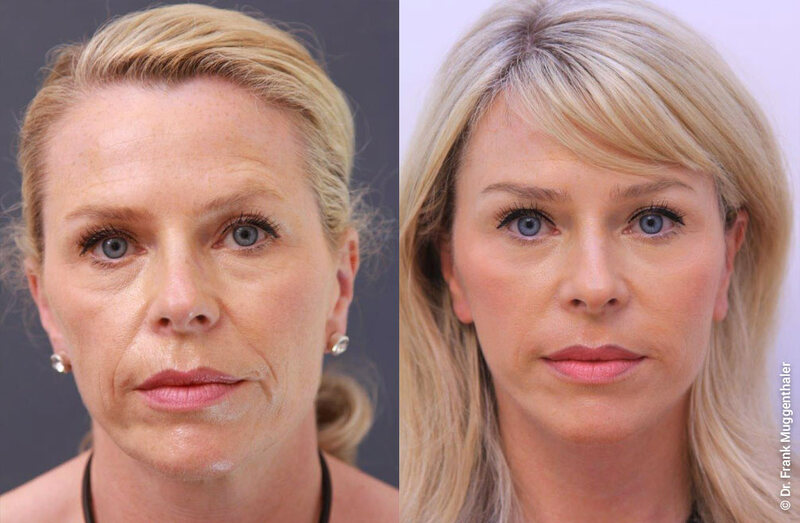 Here Dr. Muggenthaler can decide whether a facelift is the right method for your needs, or whether another treatment would be more appropriate. 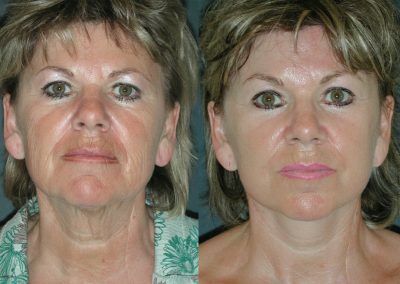 Basically, however, if lifting your face with your fingers makes a clear positive difference, the right time for a facelift has come. Yes, immediately and unreservedly. Nevertheless, you should inform us. What is the risk of infection during a facelift? A facelift in the private clinic MUGGENTHALER ÄSTHETIK is particularly safe because of the specialisation in aesthetic facial surgery: Our clinic is germ-free. The risk of infection is negligible compared to a clinic with a broader range of operations. When can I tie my hair back again without traces of the operation becoming visible? With make-up, you can bind your hair back after only two to three weeks after the facelift. 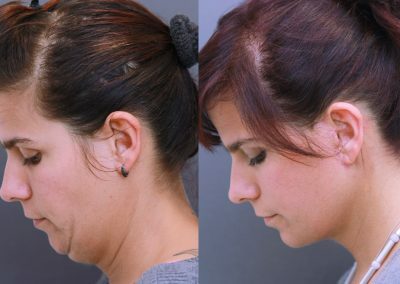 After six weeks, there is nothing to suggest a facelift, even without make-up, even if the hair is tied back. Can I wear jewellery after the facelift? Do not wear heavy earrings during the week following the facelift. When can I tint or dye my hair again? Three to four weeks after the facelift, the hair can be tinted or dyed again. 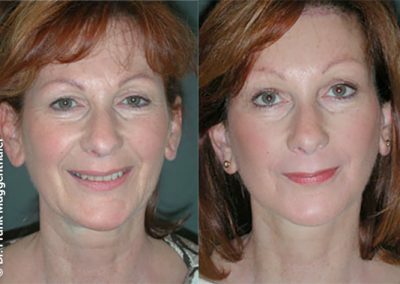 Can a facelift be performed twice? A lift performed by an expert will last at least 8-10 years. Then a further lifting can be quite meaningful. Does MUGGENTHALER ÄSTHETIK also perform post-operative corrections? 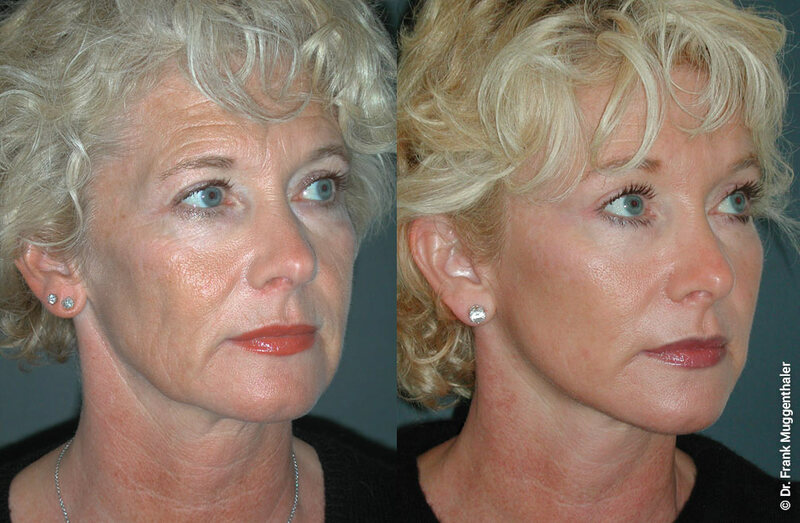 Where do the incisions go during face lifting? The incision runs in the hairline, at the edge to the auditory canal and behind the ear. In most cases, they are virtually invisible later on. Postoperative bleeding, infections and nerve damage can occur. In our clinic, infections and nerve damage have not yet occurred during a facelift. 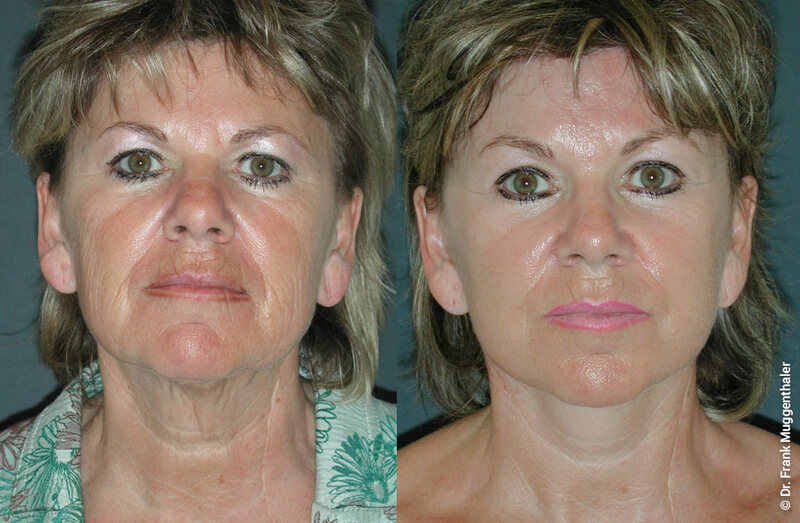 Can paralysis occur after a facelift? Paralysis of mimic muscles is theoretically possible. Permanent paralysis has not yet occurred in our clinic. Are there any facial sensory disturbances? Temporary sensory disturbances may occur. After about six weeks most sensory disturbances have disappeared. In rare cases it can take up to six months. When do I look good again? 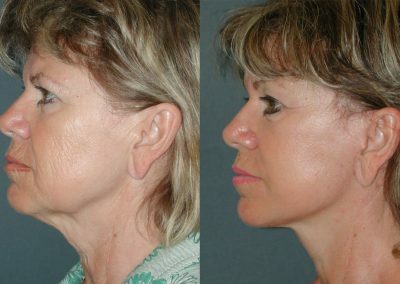 The patient is socially acceptable after about 8 to 14 days after the facelift. When can I do sports again? After approx. six weeks an unrestricted sportive activity is possible. How long is the clinic visit? One to two days, depending on the size. Shall I avoid the sun? Six weeks after a facelift you should not sunbathe unprotected. But with sufficient protection (sun hat, sunglasses, sun cream with high SPF) you can go into the sun for adequate periods of time. Afterwards a face cream with a high sun protection factor should be used. On this page, Dr. Frank Muggenthaler will answer the most frequently asked questions about facelifting. Can’t find an answer to your question here? Then get in touch with us! We will answer all your questions, gladly in a personal consultation in our practice in Basel.